my 15 2.7 EB XLT SCrew 3.31 has been getting about 18-19 in city and have topped out at 24 on a road trip. My truck has 1300 on it. The truck is stock. Most of my driving has been in city and it is around 18.5 to 19.8 per the MPG calculator on the cluster. Got about 3700 miles on mine to date, 3.55 ratio and lifetime according to computer is 19mpg. What I'm seeing on my daily commute screen which I reset at each fill up is also right around 19 but some days closer to 18.5, just depends on my driving each day. I've done a couple trips down the hwy for a couple hundred miles and on those trips I'm around 22 but I've also gone through canyons on those trips. Yes it seems like 22 is about what people are getting on the highway. I drive on the tollway by my house a lot and the speed limit is 80. Driving at 80 kills my mileage. I've noticed an improvement if I can keep it at 75 or lower and the 22mpg is at about 65ish. The city driving is where I would like to see an improvement. I have also noticed the the computer on the truck is overly optimistic. So you need to hand calculate if you want an exact mpg reading. I just filled up the other day and the truck was telling me 20.8. Hand calculated to 20.4. I pump fuel until it stops then tick to the next even dollar amount. I stopped filling it full-full. It seems the computer is more accurate if I stop when it shuts off. You know you might be on to something. Also I now have 1800 miles and it does seem more accurate maybe it needed to calibrate. Do you let your tuck idle much? I was letting it idle in the morning before work maybe 5-10 minutes and at lunch if I went to get something to eat I have wondered how much of a negative impact that was causing. I have since tried to limit the idle times. I haven't done any idling since it was icy up here but when I did I found that if I remote started, the MPGs weren't affected on the computer display. If I idled on a regular start I could see the MPGs dropping with time. I could be wrong on this, but it seemed that when I would get to work it would say like 19.3 on the readout and then in the morning when I left after idling for about 10 minutes on remote start it still said 19.3 when I started. Well, obviously I burned fuel so that would affect a hand calc. Whether that's the case for all or a fluke with me, I'm not sure. Maybe I'll check it out next time before I leave work I'll remote start for 10 minutes or so and see if it affects the last readout I had. Yes, idling does affect the MPG readout on the display for average MPG. You may not see it for a few minutes, but the longer it sits in idle, the more change you will see. I drove from Branson Missouri to Kansas City last night and this is what my truck was showing. I found that 72mph is the sweet spot. 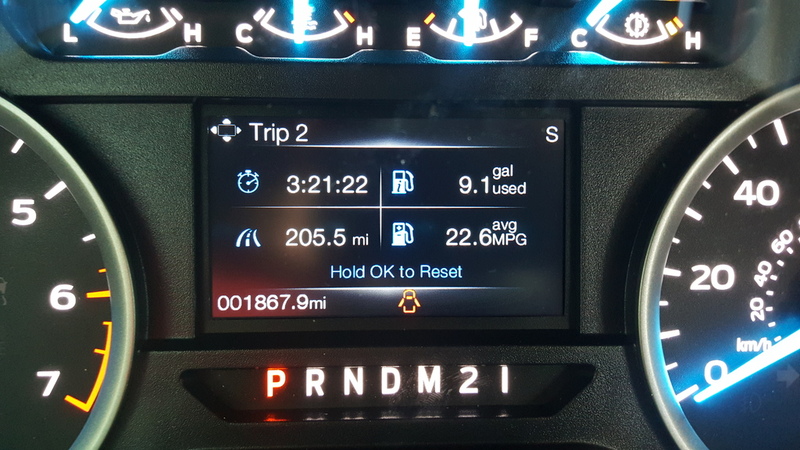 Ok so I've only driven my truck for 1200 miles so far.. but I've seen some incredible mpgs... like 26-27.. I drove 60 miles today.. average was at 29mpg when I got home... no lie... I think when it's 70-75 degrees outside I when I see the biggest numbers.. today was obviously one of those days..
Last edited by Fend2ride2; 08-30-2015 at 07:54 PM.